The Marathon des Sables is billed as the toughest footrace on Earth. It consists of around 150 miles of running across scorching desert plains and peaks, in temperatures soaring above 40 degrees C. As if the distance, the heat and the terrain were not enough, the whole race must be completed carrying all the food and kit required for the seven days of the event. The Marathon des Sables is an incredible event. The single biggest piece of advice that I received during my preparation was that mental fitness was the key. The competition itself took me somewhere that I had never been before; to new environments and landscapes, and to new friends. I hope that this book therefore conveys the spirit of adventure that I carried with me throughout, and the determination and good humour required to get me through. In this book, I will take you through my training and the competition itself, by giving you lots of tips and helping you finish this great (ultra) experience . A must read for anyone who has ever run the Marathon des Sables, anyone considering this or similar events, or for anyone who just wants to be challenged out of the easy and comfortable risk free life of the 21st century. 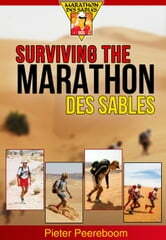 Unfortunately when selecting this title, I stopped at "Surviving the Marathon" and missed the "des Sables" (or didn't understand the specificity of the event being discussed). I'm sure that anyone training for or thinking about training for a multi-day desert run would benefit from reading this. However, there isn't much here for urban marathoners.